1. Preheat the oven to 180°C (350°F). On a lightly floured workbench, roll out the pastry to about 8 mm (3⁄8 inch) thick. Press into a 23cm (9 inch) loose-based fluted flan (tart) tin and trim the edges. Rest for 20 minutes in the refrigerator. 2. Line the tart shell with a sheet of baking paper, then fill with baking beads or uncooked rice or dried beans. Bake for 15 minutes. Remove the baking paper and beads, then bake for a further 10 minutes, or until the pastry is golden. Remove the tart shell from the oven; reduce the oven temperature to 150°C (300°F). 3. While the pastry is blind baking, heat the olive oil in a large non-stick frying pan. Sauté the leek over medium heat for 5-10 minutes, or until soft and fragrant. Remove from the heat and leave to cool. 4. 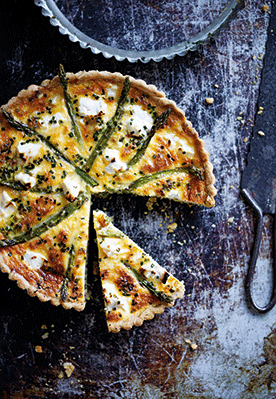 Spread the cooled leek over the blind-baked tart shell. Squeeze as much water out of the grated zucchini as possible, then arrange on top of the leek. Sprinkle with the mint and chives. 5. In a bowl, whisk together the eggs, cream, salt and pepper. Pour the mixture over the tart. Lay the asparagus spears on top, then sprinkle with the gruyère and feta. 6. Bake for 25 minutes, or until the filling is cooked in the centre and the pastry is golden. This tart is lovely served warm, but is wonderful cold as well — great to take to a picnic. 1. Chop the chilled butter into chunks, then place in a food processor with the flour. Pulse until the butter is the size of cherries. Add the sour cream and pulse again, until just incorporated. 2. Turn out onto a cool, floured surface and form the dough into a rectangle. Cover and leave to rest in the fridge for 20 minutes. 3. Roll out to the shape and thickness directed in your recipe, then press into your pie or tart tin. Trim the pastry edges, then rest in the fridge again for 30 minutes, before baking and filling according to your recipe instructions. Tip: The pastry can be wrapped up and frozen for up to 3 months; simply thaw it in the fridge for a day or overnight before using. Recipes courtesy of In the Kitchen by Simmone Logue (Murdoch Books, £17.99). Photography by Ben Dearnley.